Another beautiful (half) Irishwoman, she died nearly 33 years ago. (Oh my goodness, I’m dating myself!) Do you recognize her? She played in one of Hub’s and my favorite old films (and many more besides), and I look forward to drawing her co-star one day. Once again, I tend to see everything that is awry in every picture I draw, but at the end of a long day, with about an hour and a half to spare…it could be worse. Hub guessed her with no hints, and that’s usually a good sign. I hope you all enjoy the drawing. This is one of your best so far! Thank you so much! I was afraid no one would recognize her lol. Thank you so much, T! I’m always so happy when people guess correctly. hehe! Ooh, I bet that show was amazing. Lovely. It’s not Ingrid Bergman, is it? Thanks! Nope, her last name was a K name. Wow, I can’t think of her name, you are really good at doing faces! Thank you so much! I do enjoy drawing them. It’s always different, and it’s cool to really look at a face and see the subtle differences from one to the next. Hers was so beautiful and the photo was so great, it made it a lot easier. Grace Kelly? Have you ever drawn Winston Churchill? You guessed it! No, but that would be a great one! Thanks for the suggestion. I’d love more, if you’ve got any. Good guess! Nope, this one died over 30 years ago. It’s Grace Kelly. Although I keep seeing Nicole Kidman. I think it’s because I didn’t get her mouth (or eyes) right. 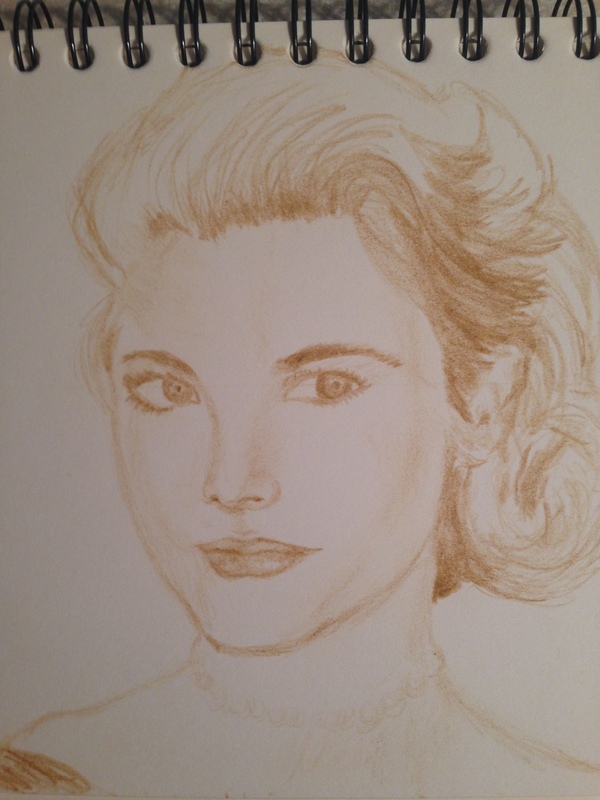 I, too, recognized Grace Kelly, which means you did a great job because the hardest part of portraiture is making it look like the actual person, as you know. 🙂 Way to go! Just stopped by and was looking over all your lovely portraits! I can really see you are growing the more you create. This portrait is so lovely! I love how soft you made her skin look.